If you cannot find the answer you are looking for, call the number at the bottom of the page. Car parks are in the surrounding fields and are free of charge. You do not need to pre-book in advance and more information about each car park can be found in the 'Parking and Transport' section below. We offer convenient glamping and camping options which are only a stone’s throw away from the Festival of Speed event. Located in the surrounding fields, you can choose a pitch with or without electric hook up and all pitches are 9 x 7 metres. Please note that all camping pitches will sell out in advance of the event. We offer a travel portal, Goodwood Travel, which gives you direct access to the best hotels and B&Bs, as well as other travel partners and international travel services, in the local area. Find out more here. The opening day of the 2019 Festival of Speed, Thursday, will be bigger and better than ever before; including the very latest road cars on the Hill and also the chance to see racing content for the first time. Friday will see the finest cars from past, present and future take to the Hillclimb on Friday as the excitement of the Festival of Speed continues to build. On Saturday, the Hillclimb action hots up and there are star appearances aplenty. Sunday is an exhilarating and exciting climax to the weekend with the Hillclimb shootout – the day of the event not to be missed. 2019 marks the 20th anniversary of the timed Hillclimb shootout record – who will take on the challenge to beat the record and be crowned the champion of the 2019 Festival of Speed? Entry is by advance ticket only. It is not possible to buy ticket(s) on the day, and there will be no admission without a ticket. I can no longer attend the Festival of Speed – can I have a refund? Orders for tickets can be cancelled, exchanged or refunded within the first 48hrs after purchase only. Please submit your request to the Ticket Office by email at customer,salesgoodwood.com or by telephone on 01243 755055. Goodwood does not issue refunds after this initial 48hr period but you may sell on your tickets via our official resale partner Twickets who are a fan-to-fan secure trading platform. Please note that selling or buying tickets on any other platform is strictly prohibited and tickets that are re-sold illegally via any other third party will be refused admittance to the Festival of Speed. Are there hospitality options available? We have a range of hospitality options available to suit both corporate groups and more informal gatherings of friends and family – all of which add further luxury and convenience to the FoS experience. Find out about these options here or call the Hospitality team on 01243 755054. What are the delivery options for my tickets? For your peace of mind this option provides you with a fully tracked and signed for delivery service via Interlink. Your tickets will be delivered to an address of your choice and require a signature on arrival. Please note – this is a secure delivery service and not a priority service. You will receive your tickets no later than five days before the event. A standard postage option within the UK which means you will receive your tickets via 2nd class post, no later than five days before the event. This service is £3.00 for UK customers and £5.00 for customers outside of the UK. Choose this option if you plan to pick your tickets up directly from the event or from the Ticket Office reception at the Goodwood Motor Circuit. Please remember to take your e-mail confirmation with you, as you will need to provide your booking reference number on collection. The Festival of Speed is held at Goodwood House. Click here for guidance on how to get to the event site – follow the signs and the stewards’ directions when you are nearby to reach car parks or entrance gates. You can download our parking & travel guide below to help plan your journey if you are arriving by car or motorcycle. Please select the colour that matches your parking label (if you have been allocated one) or the public parking icon to see public routes and car parks. In addition, you can view our interactive parking map here. What are the security measures at the Festival of Speed? The safety and security of everyone at the Goodwood Festival of Speed is of paramount importance to us. We work continually with Sussex police and other relevant authorities to reduce risk, taking action to put additional measures in place where needed. Although the national threat level has been raised for sometime, there is no known specific threat to our events to cause public concern. Although it’s important to be alert and notify staff of anything suspicious, we urge you not to be alarmed. At this year’s Festival of Speed, there will be more extensive dog and bag search procedures for everyone at entrances and you will notice a stronger uniformed police presence throughout the site and the vicinity. With increased security, access may take longer. Please be prepared for this and allow sufficient time and also bear in mind that if you exit at any stage, you will need to pass through security to re-enter. You can help a great deal by not bring unnecessary bags, and having your bags ready to be searched as you approach the gates. For any bags you do bring in, please keep them with you at all times, or use our locker facility near Gate 1. We ask for your understanding, patience and cooperation with us and that you also inform your guests and party members of this update. We also ask for your vigilance on matters of security. If you see or hear anything suspicious, please bring it immediately to the attention of the Police or our Stewards. What are 'Roving Grandstand' tickets? The Hillclimb has 12 large and easily accessible Grandstands affording excellent trackside viewing. All Grandstand tickets are Roving, which means that you can move between these 12 different vantage points as many times as you want throughout your visit. For example, you can rove between the Startline Grandstand where you can watch the cars and bikes smoke their way off the startline, up through the park and paddock Grandstands with great backdrops of Goodwood House and the cars coming out of the assembly area, to Molecomb Grandstand where the cars tackle the Hillclimb’s most challenging corner. We also have the Flint Wall Grandstand, which shows the cars negotiating this tight and challenging part of the Hillclimb. To book Grandstand tickets, please use the ticket system. Please note, children up to 2 years old (24 months) are not required to have their own seat. Due to the nature of the event, visitors can expect to experience a certain level of noise from the vehicles taking part. Ear defenders (available to buy at the Goodwood Shops on-site) will enable all visitors, especially children, to get closer to the action without feeling uncomfortable. Equally, foam ear plugs are available from all information centres free of charge. As the Festival is an open air event held primarily in parkland, comfortable shoes and casual clothing is best. Always bring some light wet weather clothing as, even in summer, the British weather can be unpredictable! If you will be using our corporate hospitality pavilions, then smart casual dress is required. No dogs or any pets are permitted into the event, nor should they be left in your car or in the campsite. Only guide dogs and assistance dogs for the disabled are allowed on site. If you have requested for your tickets to be sent in the post, please note that tickets can arrive up to five days before the event. If your tickets do not arrive five days before the event, please contact our Customer Sales team on +44 (0)1243 755055, with your order number, which can be found on your email confirmation. Where do I park at the Festival of Speed? Parking at the Festival is free and car parks open from 06:30hrs each day. Please visit our 'Travel & Parking' page for more information. Do I qualify for performance car parking? Please check this list to see if you qualify for Performance Car Parking, then visit the ticketing page to book. Bikes are not permitted into the event itself, but there are bike racks at Gate 2 (next to the hotel), and Car Park A East and West paylanes (the southern car park on the Chichester side of the event). Locks aren’t provided and are left at the owners risk. Should children aged 16 or under be accompanied by an adult? Yes, for Health and Safety reasons children aged 16 or under must be accompanied by a responsible person aged 17 or over at all times. The crèche, with baby changing facilities, is situated between the startline and the Cricket Pitch in our Family Enclosure. Ear defenders (child ear defenders are available to buy at the Goodwood Shops on-site) will enable all visitors, especially children, to get closer to the action without feeling uncomfortable. Children aged 12 years and under do not need an entry ticket, but should pick up one of our child wristbands from one of the entrances. These can be pre-booked online (choose Tickets Only and then select Children 12 & Under) or by calling the Ticket Office on +44 (0)1243 755055. Is there family camping area? In 2014 we opened our exclusive ‘family campsite’. Up to 60 families can book a 9m x 7m plot, with or without electric hook-up, with family-friendly toilets, baby change and shower facilities. The campsite will be located in the Lennox enclosure at Goodwood Racecourse, a stone’s throw from the main event, with beautiful scenic views across the South Downs and a newly renovated children’s play area. The campsite office will be open 24hours a day, manned by a dedicated Goodwood host and manager. Each family will have access to a walk-in fridge to store items free of charge. There will be a shuttle available to take you from the family campsite to the festival arena, just a few minutes’ drive away. To book camping, use the online ticketing system or call the Ticket Office on +44 (0)1243 755055. All children under the age of 17 should be accompanied by an adult. Children aged 12 and under do not require a ticket, but are strongly encouraged to wear a wristband on which you should write your contact details, just in case they become separated from you. These wristbands are available at all gates and information centres, and can be used for any one in your party you may be worried about. We recommend taking a photo of the person on your phone when you get to the event, just to aid staff in finding them should they become separated. A picture paints a thousand words, and a photo of them wearing their outfit for the day can be invaluable. Do you offer breast feeding facilities? Where are the medical facilities? The Festival of Speed has treatment centres which are manned by trained NHS doctors and nurses. They are located in the following locations: the F1 Paddock, behind the Park Grandstand, in Cathedral Walk (opposite Cartier Lawn), next to GAS and at the Rally Stage. There is an on-site pharmacy providing medicines, toiletries, suntan lotion, earplugs and sunglasses. This is located behind the Park Grandstand. Are there any banking facilities? What is the chosen charity this year? Please visit our Charities page for details of this year's beneficiary. What is the provision for disabled visitors? Those visitors displaying a Registered Disabled car badge will be directed to a dedicated parking area, from which a shuttle service to the event will operate. There are raised viewing platforms for those in wheelchairs. In addition there are 47 spaces reserved for wheelchairs in the front row of the Pheasantry Grandstand, these tickets can be purchased from the Ticket Office as well. To utilise this facility a roving grandstand ticket must be purchased for the disabled person and their carer. Disabled toilets are also available. For full details, please visit our Accessibility page. Electric scooter chairs are available for hire from Shopmobility – it is essential to pre-book with Shopmobility on 0300 500 8085 or by visiting www.cfirst.org.uk. At all our events we have gluten free and vegetarian offerings, so that our menu is more inclusive - all dietary/allergen information is available at every outlet on request. All of our caterers selling teas and coffees will offer dairy free milk as an alternative. If you lose something at the Festival of Speed, please check at the nearest Information Centre, and post event email customer.sales@goodwood.com with as much information as possible about the item and where it was lost. Alternatively if you find any lost property on event, please take it to your nearest Information Centre. Is there a storage facility? Yes, The Big Locker Hire Co. will be on site to provide a friendly and convenient storage locker service. Their lockers are perfect for storing coats, sweatshirts, day bags, handbags, picnics – or anything else you don’t want to carry around all day. Book a Cloakroom locker and you get a wristband that allows you access to the supervised locker area whenever you like. The Big locker hire co. will be on site to provide you with your very own phone charging locker. Plug in your phone, lock the door, set your personal PIN and pop back later to collect your fully charged phone. Come and go as often as you like charging as many times as you like – a great way to make sure you stay powered up. Locker availability is limited so we would recommend pre- booking. The Goodwood Festival of Speed is certified to ISO 20121, the International Standard for Event Sustainability Management. What is the daily itinerary? 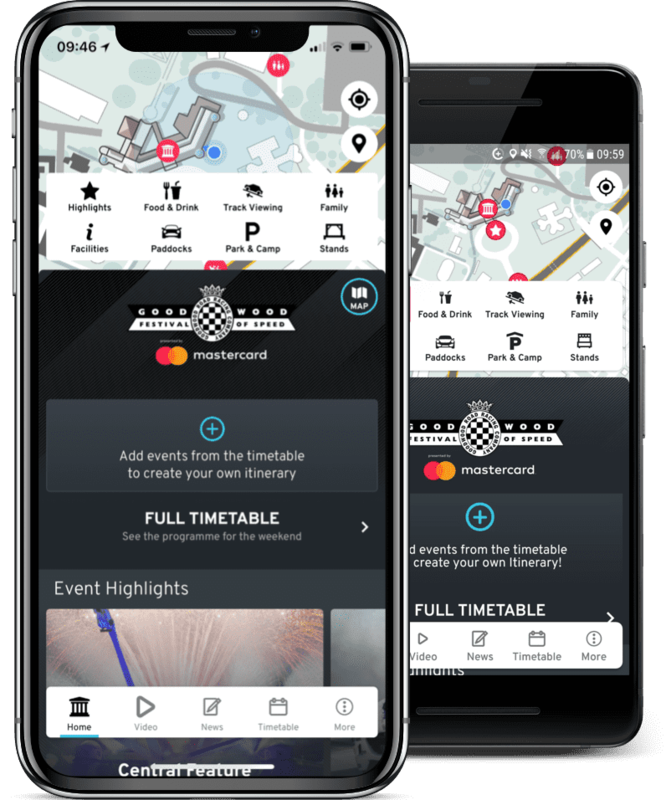 Download the free Goodwood Motorsport app via the App Store and Google Play. The Festival of Speed presented by Mastercard has expanded for 2018 and is now a full four-day event. Thursday’s new timetable will feature an opportunity for some of the world’s largest motor manufacturers to show off their latest range in their own specific batches. Alongside the designated manufacturer runs, a selection of the finest racing content will be in action on the hill, as well as the first practice session for the prestigious Sunday Shootout. At the top of the Hill, competitors on the Forest Rally Stage take their first trips through the trees as they shakedown their cars in anticipation for three days of high-speed action. The most extreme two-wheeled talents jump onto the saddle for the first of four days of intense action in the Goodwood Action Sports Arena, while the aeronautical prowess will be on show for the first of the ever-impressive air displays above the Festival of Speed site. Friday offers a second chance for the drivers and riders to familiarise themselves with the challenging twists and turns of this famously demanding Hillclimb. Many visitors take Friday as an early opportunity to view the Festival of Speed Paddocks. Filled with the greatest collection of motorsport history in one place, the Paddocks contain some of the most mouth-watering and priceless racing machines on the planet. Halfway up the Hill, the Britpart Off-Road Arena kicks off in earnest, with the most brutal off-road warriors taking on purpose-built jumps and obstacles at speeds you’d get told off for on the public roads. For those seeking a taste of the thrills of off-road action, Thorney Motorsport will be offering passenger rides around the Off-Road Arena across the weekend. The Forest Rally Stage sees its first full-throttle skirmish as the most iconic cars from every era of rallying slip and slide their way through the trees on a route designed by rallying legend Hannu Mikkola. The Goodwood Action Sports Arena showcases the finest talents in the off-road two-wheel world, as athletes from a range of extreme sports put on an extravaganza for the fans in attendance. Make sure to keep an eye on the clouds as those magnificent men in their flying machines put on a show worthy of any International Airshow. Previous years have seen jaw-dropping displays from The Red Arrows, a Eurofighter Typhoon, the last flying Vulcan and even a Boeing 747! In the gardens behind Goodwood House, the annual Bonhams Summer Sale attracts the high rollers and the dreamers to its auction of the rarest and most valuable classic cars. Purchase your copy of the souvenir programme and wander slowly around the multitude of exhibitions, galleries and shops while soaking up the intoxicating atmosphere of the world’s biggest motor racing garden party. Saturday gives Festival goers, many of whom travel across the world to see their heroes and legendary cars, the chance to watch world champions get behind the wheel of the cars that made them famous, taking on the 1.16-mile hillclimb alongside some of the most impressive and iconic cars in the history of the sport. The Michelin Supercar Run turns on the stopwatch as cars from over 20 manufacturers battle against each other to see who earns bragging rights for another 12 months. In 2017, Chris Ward took the Audi R8 to the top of the time sheets with a 51-second run. Gamer-turned-racer Jann Mardenborough and Nissan hold the fastest time ever recorded by a road car on the Hill, setting a 49.27 in 2014. The Britpart Off-Road Arena continues to showcase some of the biggest and most brutish machines making light work of the obstacles that lie in their way. Thorney Motorsport continue to offer passenger rides around the Off-Road Arena for those wanting to get that much closer to the action. At the top of the hill, the World Rally Championship teams take to the tracks through the forest in a mesmerising display of car control between the trees. Meanwhile, Goodwood Park plays host to one of the most thrilling displays of two-wheel madness there is to offer. The Red Arrows fly into Goodwood aerospace for some of the most outstanding feats of aerobatic excitement the RAF has to offer. Make sure to keep your eyes and ears open as the squadron leader talks you through this exceptional display of derring-do. The Goodwood Action Sports Arena sees the very best in Freestyle Motocross, Trials, BMX and Mountain Biking taking on a cacophony of tricks in the man-made playground for adrenaline junkies. The fastest drivers on the planet, in the most sophisticated racing cars ever made, will blow your mind with their skill and showmanship as they compete against the clock in the Sunday Shootout, all looking to beat Nick Heidfeld’s 20-year record of 41.6 seconds. The howls and growls of modern Grand Prix cars bring the crowds to the edge of the track, as the heroes of the World Championship scene come out to play. The Forest Rally Stage offers a chance to catch World Rally Championship machinery taking on Goodwood’s bespoke rally stage through the woods and vying for the coveted Spirit of the Stage award. The gladiators on the Britpart Off-Road Arena tackle the giant jumps and obstacles for one final time, while Thorney Motorsport offer thrill-seekers one final chance to get their fix with passenger rides around the Off-Road Arena. The Goodwood Action Sports Arena takes centre stage for one last day of spectacular two-wheeled stunts, with a collection of the World’s finest BMX, Trials, Motocross and Mountain Biking athletes ready to take your breath away. Keep eyes on the skies as the Red Arrows bring down the curtain on a weekend of stunning aerobatic displays with their imitable, quintessentially British display. The day culminates in the Prize Giving ceremony where The Duke of Richmond awards his much-coveted prizes and medals as the sun goes down behind Goodwood House. Where do I view the action? What footwear would you recommend I bring? It’s always a good idea to have wellies in the boot of your car. Why not check out an advance weather forecast for the weekend so that you are prepared for any eventuality. The Festival has experienced both scorching sun and torrential rain, so the best advice we can give is to be prepared for anything! We would advise strongly against bringing flip flops, as there are not appropriate for an outside event with tracking. You are able to pre-order a programme before the event from the Goodwood Ticket Office on 01243 755055. This includes an ear piece radio, timetable of events and location map. This will be available for collection from any programme sale point during the Festival. You will receive a preview of the programme by email one week prior to the event. How can I hear the action? A free event earpiece radio is included in the price of the official printed programme. This is pre-tuned to the event’s dedicated station, Radio Goodwood on 87.7fm. This radio enables you to hear all of the live action and results the moment they happen. Is there anything I can’t bring into the Festival of Speed site? How do I get up to the Rally Stage? We offer a complimentary tractor-and-trailer service, which is available from the Formula 1 Paddock. Alternatively, why not take a pleasant walk alongside the Hillclimb and take in the beautiful juxtaposition of genteel heritage and fierce modernity? This takes approximately 30 minutes from Molecomb Corner.